﻿We are looking for a customer facing, detail-oriented and organized Customer Engagement Manager who loves people and creative thinking. You’ll be working with our self-service customers all around the globe, helping them optimize their usage and better manage their accounts. You will focus on improving Cloudinary’s upgrade (and downgrade) processes, offering support and responding to related customer queries. 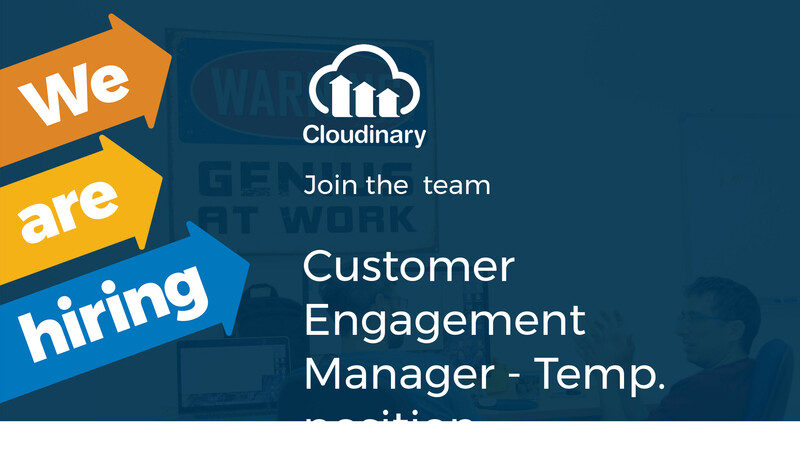 If you want to be a part of a fast-paced company, join our talented Customer Success team. This is a temporary position, replacement for maternity leave, for a minimum of 8 months. Provide support for our self-service customers in all account and plan management aspects. Answer account related customer queries via the ticketing system. Proactively reach out to customers based on usage data. Create analytical reports based on account usage. Create actionable items from customer feedback and interaction. Improve work processes and create efficient automation. Contribute to the pricing definition and efforts of the company. Work closely with our Customer Support Team. Work in collaboration with different departments within Cloudinary, such as Finance, R&D, BizDev and Product. Provide a professional, high level of service both within the company and externally. Minimum of 2+ years of customer facing experience. Native spoken and written English is a must. Prior experience working in a SaaS global company a plus. Compassion, ability to understand customers and diffuse complex situations. Creative and rational mind - able to analyze a situation and find the best resolution. Highly motivated, and able to work both independently and as a part of a team. Solid analytical, oral and numerical skills.